The De Tomaso Pantera (Italian for “Panther”), is a mid-engine sports car produced by the De Tomaso car company of Italy from 1971 to 1993. Imported by Ford Motor Company and sold by the Lincoln Mercury Division from 1971 through 1974. Designed by the Italian design firm Ghia’s American-born designer Tom Tjaarda it replaced the De Tomaso Mangusta, in the De Tomaso line up. Unlike the Mangusta, which employed a steel backbone chassis, the Pantera was a steel monocoque design, the first instance of De Tomaso using this construction technique. The Pantera debuted in Modena in March 1970 and was presented at the 1970 New York International Auto Show a few weeks later. Approximately one year later the first production Panteras were sold, and production was increased to three per day. 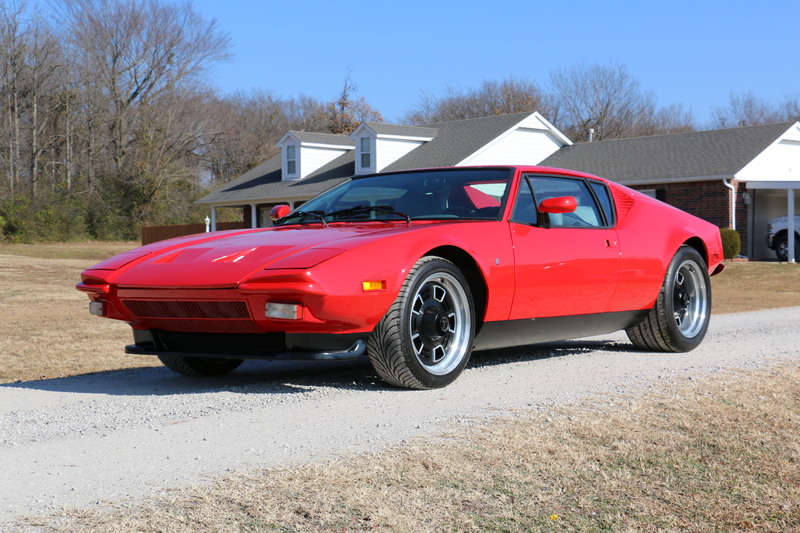 The Panteras were powered by a Ford 351 cu in often referred to as the Cleveland (5.8 L) V8 engine producing 330 hp, The ZF transaxle used in the Mangusta was also used for the Pantera, Power-assisted four-wheel disc brakes and rack and pinion steering were all standard equipment on the Pantera. With respect to this particular Pantera the body was restored back to the original except for the hood in 2018 and looks absolutely Amazing inside and out. It Runs and Drives like it looks! Just serviced and inspected, everything works as it should and ready for a cross country trip. Fly in and drive home. Showing Only 43.000 Original Miles, Ford’s Legendary 351 Cleveland rebuilt 300 miles ago and Street Tuned, Original ZF 5-speed Manual Transaxle w/ Gated Shifter, new clutch, pressure plate, throw out bearing and long throw slave cylinder. Mirror Finish with protective coating, Red Paint Professionally applied, new windshield and no mars in the rest of the original glass. Great looking, gray custom interior with full factory console. A Show Ready Detailed Engine with the rear compartment stripped of undercoat and a front trunk compartment with new brake and clutch master cylinders. 17″ Hall Aluminum custom wheels and new tires. Hall custom square headlights. Great sounding Dual exhaust with Headers and the Iconic Quad Tips.